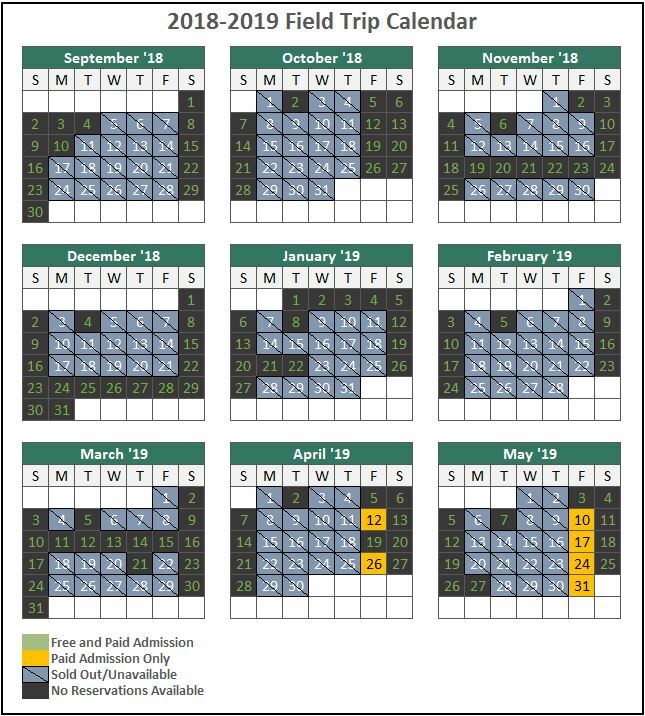 Most dates for the 2018-2019 school year are now filled. Check the calendar below for open dates. All groups requesting a field trip must complete the field trip reservation request form. We limit school reservations to prevent overcrowding and to maximize your field trip experience. Schools qualifying for free admission may reserve visits Monday – Thursday. Fridays are reserved for schools with paid admission tickets. Availability is subject to change. When reserving your tickets, carefully review how many individuals will be in your group. You must provide at least one adult chaperone for every ten students, grades K-12, and at least one adult chaperone for every five Pre-K students. Chaperones must accompany their groups for the duration of the visit. Complimentary adult chaperone tickets are provided based on the student to chaperone ratio above. Teachers and staff are considered part of this ratio. Any additional adult chaperone tickets will be billed accordingly at the rates below. All students, teachers, chaperones and bus drivers need a ticket to enter the Zoo. Purchase tickets for additional adults in advance, as we are unable to add tickets to your order on the day of your visit. Discounted tickets are not available for purchase at the gate. Add Wildlife Carousel rides to your order for $2 per ticket. Email fieldtrips@houstonzoo.org and reference your invoice number to receive this special pricing. While completing the online form, you will be prompted to choose your top three preferred dates. We do our best to accommodate your requests if available. Be as accurate as possible when requesting ticket quantities. Excessive amounts of unused tickets limit the number of students who may benefit from a trip to the Zoo. Upon confirmation that your reservation has been booked, you will receive an invoice with details for payment. All field trips require a minimum $15 processing fee. Payments must be received no later than three weeks (21 days) prior to your visit. Any requests for changes after your invoice is received must be made in writing and sent to fieldtrips@houstonzoo.org. Exceptions for late payment cannot be made. If you are mailing a check, please ensure receipt by the Zoo no later than three weeks prior to your visit, or your trip will be cancelled. We are unable to accept field trip payments at the Zoo. Check by mail or credit card payment, via the link below, are the only forms of payment accepted. If you have received an invoice and are prepared to make a payment, please click the button below. In the event of a cancellation, we are unable to refund the processing fee. We do our best to accommodate rescheduling, but cannot guarantee that a reschedule will be possible. All reschedules are subject to a $25 reprocessing fee. Tickets issued as a result of a reschedule will not be mailed. Ready to Reserve Your Field Trip? Make sure you have read all the information on this page before you begin! Who qualifies for field trips? Only educational institutions accredited by the Texas Education Agency or the Texas Private School Accreditation Commission qualify for school field trips. We also accept requests from schools recognized by the Louisiana Department of Education. Requests made by affiliate programs will be denied. Which schools qualify for free field trips? Public and private schools located within the Houston city limits and Title 1 schools in outlying cities qualify for free field trips. Processing fees apply. Autumn months are ideal for a school field trip to the Zoo. The weather is cooler, the animals are more active and there are fewer crowds. Since most testing occurs toward the end of the school year, booking your trip early will limit the probability that your trip will interfere with test schedules. Who is considered a chaperone? All tickets are non-refundable and non-transferable. If you choose to cancel your reservation, we will do our best to reschedule based on availability. All reschedules are subject to a $25 reprocessing fee. The Houston Zoo reserves the right to cancel any program due to minimum enrollment, inclement weather, or unforeseen circumstances, in which case a full refund will be issued. Cancellations are official upon receipt of confirmation from the Houston Zoo. How do I schedule a field trip in the summer? Field trips can be booked September through May. 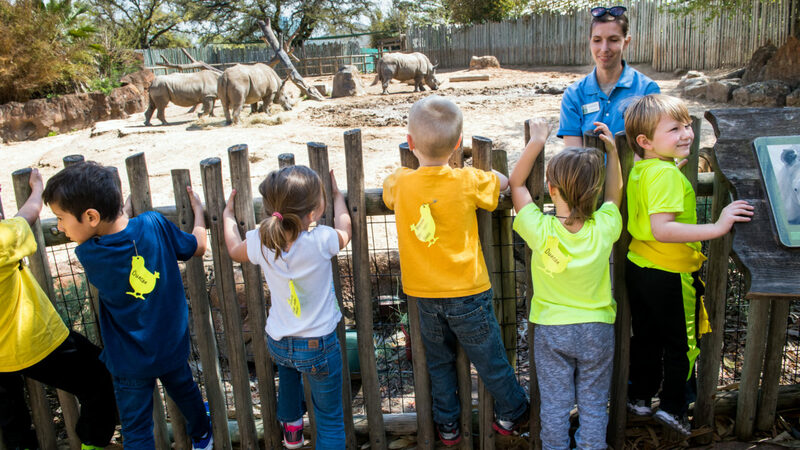 If your school group is planning a visit to the Houston Zoo this summer (June through August), you are eligible to receive discounted admission for groups of 20 or more. Please visit Group Admission Discounts for details. The Zoo is open rain or shine. We have many indoor facilities, and if you dress for the weather, you can still thoroughly enjoy your visit! If you choose to cancel your reservation, we will do our best to reschedule, provided there is availability at a later date. All reschedules are subject to a $25 reprocessing fee. We have made changes to our bus parking protocols, so please make note of the following instructions. Upon arrival to the Houston Zoo, we ask that all bus drivers unload all students, chaperones and teachers curbside at Parking Lot F, which is next to the Hermann Park mini train. We will have Houston Zoo Ranger in the area to help the group unload properly and safely. Once everyone has been unloaded, please drive to our new off-site bus parking area located at 1505 Cleburne St. Once you arrive at the off-site location, another Houston Zoo Ranger will direct the bus driver where to park. The lot will have patrolling security throughout the duration of the field trip. At the end of your students’ visit, you will load students, chaperones and teachers back at Lot F by the curb in the same area you dropped them off. We appreciate your patience and understanding as we continue grow in support of our mission to connect communities with animals, inspiring action to save wildlife. How does my group enter the Zoo? We ask that you distribute all tickets to your students before approaching the main entrance. You will be directed by a member of our staff to line up before proceeding through the gate. Zoo maps will only be distributed to the group chaperones. No, you do not need to check in. A few days leading up to your visit, you will receive an email reminder requesting the contact information of the person who will be on-site the day of your visit should there be an emergency while your group is on Zoo grounds. What if a student or chaperone in my group is arriving late? Tickets for late arrivals may be left at Guest Relations for pick up. Upon checking in and retrieving their ticket, they will then be granted entry separate from your group. What if a chaperone needs to buy a ticket? We recommend that chaperones purchase their tickets in advance in order to enter when your group arrives. Chaperones do not receive a special price at the gate, but they are welcome to use their Membership. What if I do not have enough tickets? We are unable to add additional tickets to your order on the day of your visit. Please review your invoice thoroughly before submitting your payment. If you need to add additional tickets to your order after payment has been made, please contact fieldtrips@houstonzoo.org for assistance. Additional tickets will not be mailed but will be available to pick up at Guest Relations. Regular gate price applies to any ticket not purchased in advance. What if I have extra tickets? We ask that any extra tickets be returned to Guest Relations before your departure. As a reminder, unused tickets are non-refundable and non-transferable. Please note that tickets are only valid for individuals in your group. You are welcome to bring outside food and drink, however, there is no storage area available for these items. We have several picnic and shady areas around the Zoo where you may enjoy your lunch. We suggest choosing a place ahead of time and communicating that location to your group. We appreciate you reminding students to pick up after themselves before departing. What must I do if an emergency occurs while we are at the Zoo? If you are in need of assistance while on Zoo grounds, look for a Zoo Ranger wearing a red polo shirt. If you are unable to locate a Ranger, call 713-533-6500. What rules should we follow during our visit? Before you arrive, please visit the Guest Services page to review all rules regarding food and drink and which items you can and cannot bring into the Zoo. There is also a list of reminders to “Mind Your Zoo Manners” on our Zoo maps. An adult chaperone should accompany your students at all times.